A fun reading and activity book for those who look after young and very young relatives while Mummy and Daddy are out at work. * Stories to read which are specially written to appeal to the young and very young age groups. * Asides, questions and ideas to involve the child in the story — no passive listening here. * Simple moving around activities to make a change from sitting reading. * Simple crayon and paper fun aimed at all younger ages. If a child can hold a pencil - that is good enough to start joining in. And of course, older children will enjoy showing how skilled and clever they are. I have made the stories and activities revolve around teddy bears and plain paper and crayons. This is because most households with children already have these things and no extra expense will be involved. Anyway that has told you something about the book. I hope you find it helpful — I do every Wednesday when I look after my youngest grandchild. Barbara Hayes was born in Watford, went to the local grammar school, where she became head girl - a sort of Bossy Boots. Barbara found a career in children’s comics and for several years she wrote all the stories in Teddy Bear Weekly for the Amalgamated Press. She also wrote stories for other comics and books - many of them about teddy bears. Barbara is now a widow, but she is lucky that her children and?grandchildren live within a few miles and she sees them often. 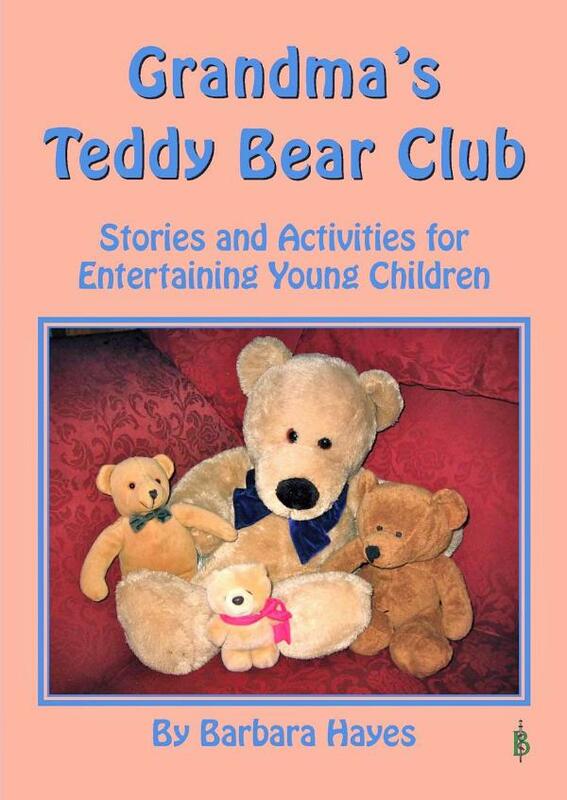 And of course the youngest grandchild loves to hear the stories from the Teddy Bear Club. This is a story from Teddy Bear Land about another very nice kind hearted little bear, but she was just a little more pushy than the Cuddles Bears. We will come to some of the adventurous bears later. This bear was really Brenda Bear, but soon everyone forgot about that and she became known to the people living in the street as Watch from the Window Bear. Brenda was young. She was not old enough to go school. But when the bigger bears used to go off to infants school or junior school or even senior school, Brenda used to miss them and feel lonely. She used to worry about them. And Brenda Bear used to go up to the window on the landing upstairs and sit on the windowsill looking out and longing for the other bears to come home. Everyone walking up and down the street used to look up and see Brenda Bear watching from the window. And they started calling her that Watch from the Window Bear. Luckily everyone always did get home safely and Brenda Bear was thrilled and they all used to play and have tea together. The only problem was that sitting next to a cold, draughty window made Brenda feel chilly all the time. So her mummy knitted her a thick warm jumper to wear. And ever after that Watch from the Window Bear as she was called was nice and warm and cosy as she watched for all the others to get home. So Grandma, who was very good at knitting said that she would knit some teddy bear sized warm woolly jumpers. Then the children who wanted to could put the jumpers on to one of their bears and sit them by an upstairs window that looked out over the street. — And there — they would have their very own Watch from the Window Bear looking out for them to come home safely. And do you know after that story in all the grandchildrens’ and friends’ houses there used to be a teddy bear watching from an upstairs window looking for their little owners to come home — all the bears wearing nice woolly, snuggly jumpers of course. When the story of Watch from the Window Bear was over some of the children said that they wanted to learn to knit like Grandma so that they could knit jumpers for their teddies whenever they wanted to. Now being able to knit is very useful, but learning to knit is rather difficult. You have to be quite big to hold the knitting needles and the wool properly. Can you knit? If you can you must be quite big and very clever. So Grandma said they would have to leave learning to knit until they were older. If they did not have anyone who could knit a jumper to turn their teddy into Watch from the Window Bear, wrapping a little warm scarf round its shoulders would do just as well. However on that afternoon whether they could learn to knit or not, the children were tired of sitting listening, so to give them something frisky to do (frisky means something that makes you jump and dash about) Grandma put a bear with a jumper on in an upstairs window, looking out. Then she said the children must go to the end of the garden and pretend they were at school. Then they must run back indoors as fast as they could because Watch from the Window Bear was looking for them and wanting them to get home safe. The children stood at the end of the garden then ran back up as fast as they could, looking where they were going and not tripping over of course. When they got indoors they called upstairs. “We’re home safe, Watch from the Window Bear”. Grandma said that made Watch from the Window very pleased. That was supposed to be the sound of the front door slamming after they had come indoors. Then Grandma called up the stairs: “All the children are home from school. You can come down now Watch from the Window Bear.” She fetched Watch from the Window Bear downstairs and they all played Hunt the Slipper. The children would all shut their eyes and Grandma would hide a slipper. She usually hid it under a cushion or tucked behind the sofa — somewhere fairly easy anyway. Then Grandma would call “Open your eyes and find the slipper.” And the children did. They all enjoyed it. Then it was time for a drink and a piece of cake and after that to go home. Wasn’t that nice?